Lexington, Kentucky, 1859. After saving John Hunt Morgan from a puma attack, fifteen-year-old farm boy Will Crump joins Hunt's militia, the Lexington Rifles. Morgan mentors Will and enrolls him in the local university, where he hopes to study law. As tensions rise between the North and South, Will is torn between his loyalty to Morgan and his love for his family. Will's father, sisters, and sweetheart follow the Union, while Morgan and Will commit to the South. As part of Morgan's band, Will participates in ambushes and unconventional warfare until his first real battle at Shiloh. He fights bravely, but increasingly questions what the war is accomplishing, and whether his devotion to honor has led him astray. And where is God in all this killing? Will's sister Albinia, friend of the Clay family, becomes increasingly aware of the plight of the slaves. When she finds Luther, a slave she knows, trying to escape, she must decide between her conscience, and her friends. She becomes involved in the Underground Railroad, helping slaves to freedom - but will it cost her love and her freedom? Will's other sister, Julia, is approaching spinster status and despairs of ever meeting a man who can give her more than life on a farm until she meets Hiram Johannsen, a son of immigrants who owns a steamship company. They marry and she makes a new life in the North. When Hiram answers the call to fight for the North, Julia runs the steamboat company in her husband's absence and uses her boats to help Albinia ferry escaped slaves to freedom. Her business relations put her in the perfect position to spy for the North. When the Confederates capture her, will she survive? Luther is one of the first slaves Albinia helps flee the South after his master cruelly abuses his mother and sister. 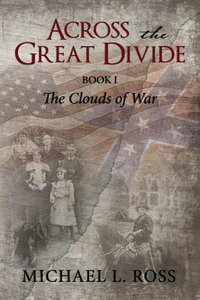 He escapes with his family, and when war breaks out, he fights for the North as an auxiliary of the Third Ohio Cavalry, alongside Julia's husband, Hiram, and against Morgan and Will. Luther has to confront the demons of his past, an abusive master, and a slave catcher that kills his little sister. Will the desire for revenge destroy him? Throughout the war, Will is forced to examine and question everything he believes in-his faith in God, his love for his family, his loyalty to Morgan, and his worth as a human being. About "Across the Great Divide (#01 in The Clouds Of War Series)"